In some respects this young Egyptian king is one of the most remarkable persons in human history. During this time of increasing spiritual depression in Mesopotamia, he kept alive the doctrine of El Elyon, the One God, in Egypt, thus maintaining the philosophic monotheistic channel which was vital to the religious background of the then future bestowal of Michael. Saint-Domingue, today Haiti, was once the wealthiest in the Caribbean. In 1789, with about 528,000 African laborer, with 30,000 European rulers. And in 1791 the 13-year-long Haitian Revolution began. Haiti, is by far, the country that has been worst punished and most hated for forcing Europe and America to put a punctuation in their concept of superiority. 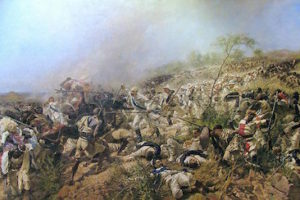 Not only did the Haitians defeated the European folk hero, Napoleon, they held America, British, France, and Spain armies at bay for one hundred years (100 years); with all their power and superiority, the Europeans and Americans could not broken down the Haitian defense.